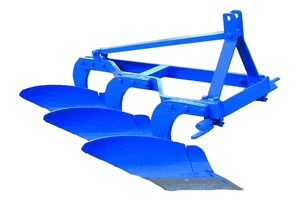 Samyak Agro Industries also has range for agriculture purpose we have developed Mouldboard Plough. Mould Board Plough is the most important plough for primary tillage in canal irrigated or heavy rain areas where too much weeds grow. The objective for ploughing with a Mould Board is to completely invert and pulverize the soil, up-root all weeds, trash and crop residues and bury them under the soil. The shape of mould Board is designed to cut down the soil and invert it to right side, completely burying the undesired growth which is subsequently turned into manure after decomposition. - It can handle the toughest ploughing job with outstanding penetration performance. - It is designed to work in all types of soil for basic functins such as soil breaking. soilraising and soil turning. - It can be used in stony & rooted soils. -The under-frame and unit-to-unit elearance are adequate to copy with trashy condition. - Adding an extra furrow or repositioning units to allow for extra clearance is quick and easy. - The plough has special wear-resistant steel bottoms with bar points for toughest ploughing jobs. - Bar point bottoms ensure longer life as they can be extended or reversed and re-used fill the last possible length.